My classroom and curricula are set up that my students collaborate everyday in my class. In order to effectively collaborate with one another, they need to both feel comfortable within their groups and feel comfortable asking me for help when needed. Therefore, they need to get to know each other and me! In this blogpost, I am going to share with you a few ways that I have my students get to know one another. Please comment with additional suggestions that you use in your classrooms! On the first day of class, I had students in a seating chart, with name cards (notecard folded in half) telling each student where to sit. As they are sitting down, I ask students to adjust their name on the card, if they have a nickname, and then write down any special needs on the inside of the card (ie: sit in the front of class). 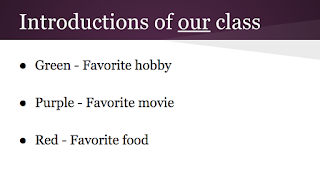 Sometimes I have to prod students to share, but most of the time students are eager to share. 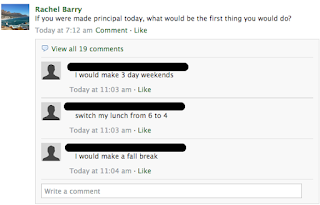 Everyday that we don't have an assessment in class, I ask students a "fun" question. 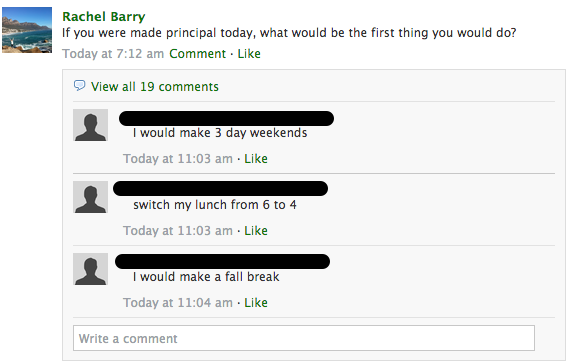 This year, I am using the Updates feature in Schoology. 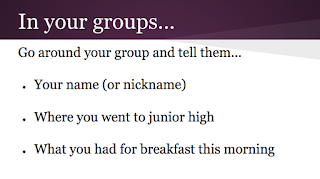 It's a quick attention-catcher right when the bell rings, and takes students less than 30 seconds to answer, and we all mutually learn more about one another in the process. In the past, I have made new seating charts every unit, however, I feel that some students become complacent in their spots. This year, I am going to switch seats every two weeks. On the first day of a new seating chart, I have students introduce themselves, shake hands, and provide some type of fun fact (birthday month, dream job, favorite fruit, etc.). 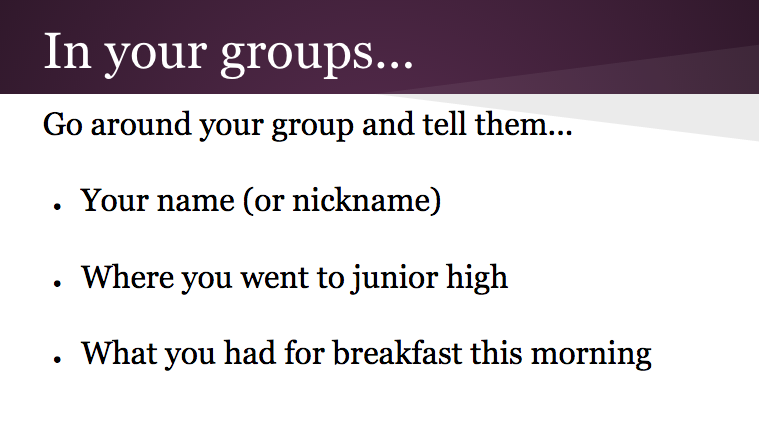 Throughout the year, I use different methods to group students that also allow students to get to know one another. Whether they are lining up by shoe size or grouped by their favorite fast food restaurant, I hope that they are becoming more comfortable with their peers, which I hope will lead to more collaboration. 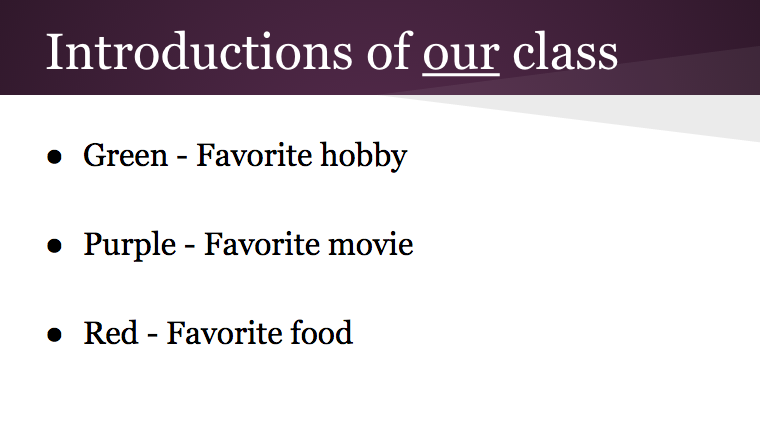 Please comment with any additional methods you use in class to get to know your students and provide them with opportunities to get to know one another! Using pods daily for the first time this year so excited to try some of these out!